Omega’s rugged OMPBD7 pilot devices offer maximum flexibility and a wide choice for all applications. This 22mm line is aesthetically appealing and modularly designed to make assembly and interchangeability easy. The OMPBD7 operators are available in two different body styles to meet every application need. Both operators exhibit a new lower profile stylish appearance while maintaining the rugged performance necessary for demanding environments. OMPBD7P is a plastic operator with a captive black plastic front bezel. Constructed of high-grade thermoplastics the OMPBD7P is the corrosion resistant solution for harsh environments. For super tough applications, the OMPBD7M has a die-cast zinc housing and mounting ring for rugged durability. Both are finished with corrosion resistant chrome plating. The OMPBD7M also features a captive shiny metal bezel for a polished appearance. 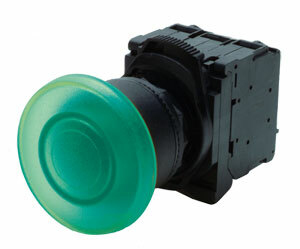 Omega offers OMPBD7 pushbuttons in a wide range of devices - from selector switches to multifunction pushbuttons. Their modular design keeps the number of required parts to a minimum, while offering multiple functions and a variety of style and color combinations. Back-of-panel components can be combined with all front elements, making the OMPBD7 line extremely flexible. This approach reduces inventory, yet provides virtually any configuration you require. A standard anti-rotation tab keeps front elements from turning or falling off the control panel, making it possible for one person to install all OMPBD7 components even if the front and rear panel are not accessible at the same time. A central mounting ring allows for quick installation and removal of all OMPBD7 operators. All back-of-panel components including contact blocks and power module elements snap-on and are readily accessible and interchangeable without removing the pilot device from the panel. The OMPBD7 "toolless" mounting latch mates the front element with the contact blocks and other back-of-panel components. The mounting latch is available in a plastic and metal design. The latches are easily installed with a "click" and removed by pushing a rotating collar to the right. Quick, reliable and strong, it’s the best pilot device mounting latch available in the industry. Most OMPBD7 operators have a mechanical of ten million operations - five million contact blocks. Electrical life ranges from 500,000 cycles at 3 A to ten million at 0.1 A. The OMPBD7 line is also electronics compatible with self cleaning contacts. Front elements, including pushbuttons, mushroom operators and selector switches, are IP 66 protection against submersion, oil and dirt, making them reliable in the toughest industrial environments. Metal operators are Type 4/13 and Type 4/4X/13 for plastic operators. Note: Push buttons come with operator, mounting latch and 1 contact block. Three additional contacl blocks can be added to each operator. Light modules are ordered separately.